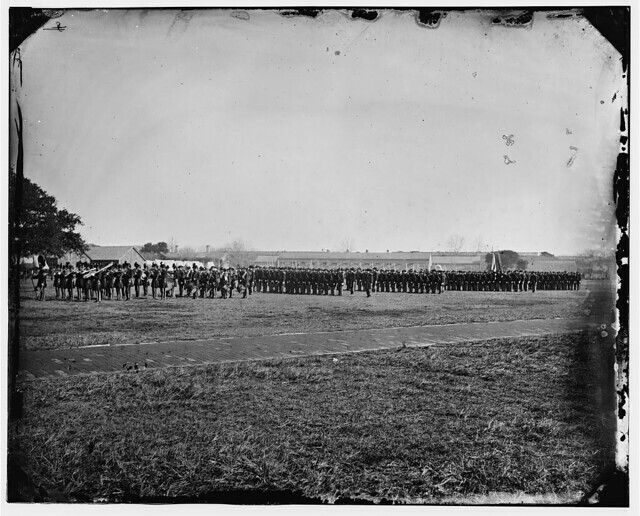 Battery H, 3rd Artillery: At Baltimore, Maryland with four 10-pdr Parrotts. Captain William D. Rank commanded this battery, the “light” battery of the regiment. As alluded to for the previous quarter’s entry, this battery was inadvertently caught up in the Gettysburg campaign. And for the record, the battery was not included in that previous quarter’s summary. Rather it warranted mention as one overlooked by the Ordnance Department. Battery H was originally recruited to round out Colonel (well really Major) Herman Segebarth’s battalion of “marine artillery” stationed at Fort Delaware. Battery H was among those formed in the winter of 1862. 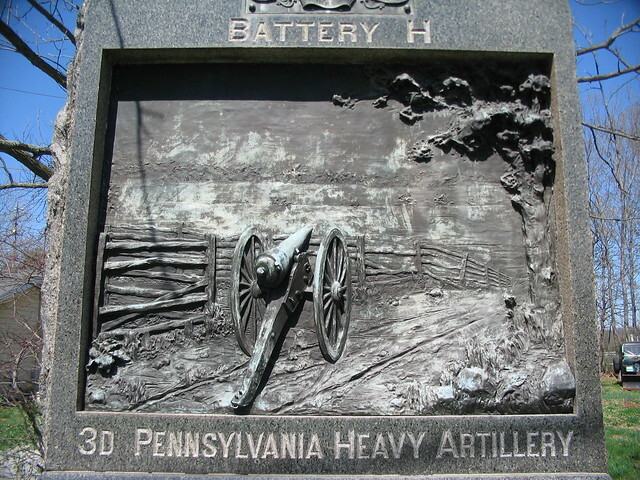 Later in the fall, the battalion was joined with batteries from Colonel Joseph Roberts’ battalion heavy artillery to form the 3rd Pennsylvania Heavy Artillery (152nd Regiment Pennsylvania Volunteers). And from that regiment, Battery H was detailed to serve at Baltimore, while most of the regiment was sent to Fort Monroe. Battery H performed duties with the other garrison artillery there around Baltimore. On May 6, 1863, Battery H reorganized as light artillery to support cavalry detachments in the Middle Division. Battery H sent a section of two guns in support of the 1st Delaware Cavalry posted to defend the Baltimore & Ohio bridge over the Monocacy in June. When word came of the Confederate movements into Maryland, the detachment was supposed to fall back to the Relay House, near the Thomas Viaduct. But before the detachment could reach that point, the section was instead directed to accompany Gregg’s cavalry division from the Army of the Potomac. The battery fired in support of the cavalry on July 2, from a position along the Hanover Road. And then on July 3, went into position to support the Second Corps. Now we might contend the section had 3-inch Ordnance rifles on those fateful days in July 1863, only to turn them in later for Parrotts. Or perhaps it was only that section with the wrought iron guns. Or, given the wonderful artwork on the monument, the battery had Parrotts on the field at Gettysburg. 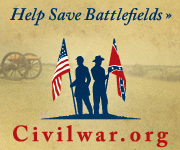 Likely some Gettysburg historian has traced down the details of this small bit of trivia. I would simply point out the battery reported Parrotts on hand four months after the battle. Battery H: 395 shell, 320 case, and 80 canister for 10-pdr Parrott. The other pages are posted on Flickr for those who wish to verify a stray tally went unnoticed. Battery H: Twenty-three horse artillery sabers. Battery A: Captain John S. Stevenson was promoted to Major in August, and replaced by John Krause, promoted on September 22. The company was at Fort Monroe. Battery B: Captain Franz Von Schilling in command. Stationed at Fort Monroe. Battery C: Captain George K. Bowen. At Fort Monroe. Battery D: Lieutenant Edwin A. Evans, prompted to captain in October. Stationed at Fort Monroe. Battery E: Captain Samuel Hazard, Jr. At Fort Monroe. Battery F: Captain John A. Blake. The company served as prison guards at Camp Hamilton, just outside Fort Monroe. Battery G: Captain Joseph W. Sanderson. At Fort Monroe. Battery H: As detailed above, under Captain Rank and serving at Baltimore. Battery I: Captain Osbourn Wattson. At Fort Monroe. Battery K: Captain Eugene W. Scheibner. At Fort Monroe. Battery L: Captain Joseph B. Bispham. At Fort Monroe. Company M: Under Captain Francis H. Reichard and stationed at Fort Delaware. This company appears to be the last to recruit up to full strength. By December, the company was at Fort Monroe. Now before we characterize the 3rd Pennsylvania Heavy as some regiment that just lay about the fortifications for the war, let me say their service from the fall of 1863 to the end was varied. Detachments of the regiment served in a “naval brigade” formed to man and support gunboats operating on the James and other waterways in coastal Virginia and North Carolina. These saw much action keeping Federal supply lines open. Twenty-two of the regiment were captured when their armed steamer Bombshell was sunk during the battle of Plymouth, North Carolina, on April 18, 1864. Other detachments from the regiment secured and operated lighthouses along the Virginia coast and waterways. Batteries D, E, G, and M served in the Army of the James during the Petersburg Campaign, on the Bermuda Hundred front, mostly supporting siege batteries. Battery E, in particular, manned Fort Converse which secured the bridge over the Appomattox. And Battery I served as headquarters guard for the Army of the James. In short, while only Battery H can claim to have seen the “big elephant” by way of circumstances that brought them to Gettysburg, the rest of the 3rd Pennsylvania Heavy Artillery did contribute to the war effort.